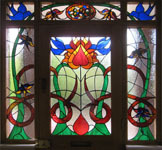 Stained glass front door restoration is the most popular customer enquiry. 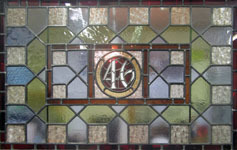 Stained glass door panels will enhance the entrance to your home. 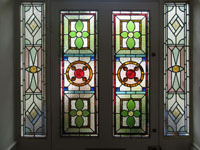 We can restore your existing stained glass front door or, if your home no longer has the original stained glass, we can replicate neighbouring original stained glass designs. 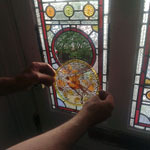 For stained glass restoration, the process would be to take the stained glass out of the door, measure the rebate, board up, take back to the studio, take a rubbing, un-lead, re-lead, replace broken panes, rebuild, cement, polish, place new ties and new steel saddle bars, refit and replace with new window beads or putty.